“Knitting Instructions: Sweaters” ARC 400-B, Sleeveless sweater pattern issued by the American Red Cross in May 1918 as a revision to one issued in 1917. Many contemporary knitters know that their knitting forebears made socks and sweaters for soldiers during the First and Second World Wars, but what’s less well known is how carefully the American Red Cross organized the knitting response during both wars. They developed and distributed knitting patterns and yarn, provided help to volunteers struggling with their knitting, collected and packed finished garments, and worked with the military to distribute them to servicemen at home and abroad. Without the Red Cross, the knitting effort would not have been as organized or as efficient, despite the enthusiasm of knitters during both wars. Knitting was one of the first responses to the outbreak of the First World War in August 1914 in the US and in Europe. However, it wasn’t until the summer of 1917, after the United States entered the war, that the knitting fad hit a fever pitch. Although other relief organizations also organized knitting campaigns for troops during the First World War–most notably the Navy League of the United States–the American Red Cross program was the largest and most well known after the fall of 1917. In May 1917, the Red Cross’s Executive Council created a Women’s Advisory Committee to advise the newly created Woman’s Bureau, a special department meant to organize the “activities of women (other than professional nursing) […] in useful Red Cross activity.” The leader of the Woman’s Bureau, a woman named Florence Marshall, took a leave of absence from a her job as principal of the Manhattan Trade School for Girls, one of the earliest vocational training schools for young women. Marshall used her background in vocational education to survey the existing knitting patterns meant for soldiers, and to find out exactly what the military recommended and needed in handmade garments. The result was the release of a knitting pattern booklet, “Instructions for Knitting” (ARC-400), the first nationally released knitting pattern booklet issued by the American Red Cross. The booklet contained seven different knitting patterns for garments all to be made in oxford gray 4 ply 10s wool yarn and a washcloth pattern to be made in cotton, all available from local Red Cross chapters. Like all good knitting patterns, it also included information about the yarn and needles required for each pattern, but the Woman’s Bureau decided to specify three standard “Red Cross Needle” sizes, and printed their diameters in inches. Because knitting needles were not yet standardized, Red Cross Needle no 1, 2, and 3 ensured that knitters knew what size to use no matter who manufactured their needles. Finally, each pattern was based on existing patterns for soldier’s garments in use by other relief organizations, and was designed to be easy to knit by a wide range of knitters with different skills, and included very little seaming, shaping or finishing. Several additional pattern booklets were issued between July 1917 and October 1917 that included guidelines and patterns for infants’ layettes, children’s clothing, men’s and women’s clothing, and surgical dressings, as well as guides for preparing comfort kits and Christmas packets for the armed forces. The patterns allowed Red Cross volunteers to make clothing that was fairly uniform and would stand up to heavy use abroad. Uniformly made clothing also allowed Red Cross volunteers stationed in Europe distribute the clothing more easily, since careful volunteers back in the States packed clothing based on size and type. However, the Woman’s Bureau did not exist as a separate entity for long. In December 1917, the Woman’s Bureau was reorganized and became part of a different department, the Department of Development, which oversaw all membership matters in addition to developing and distribute knitting and sewing patterns for servicemen and civilians. As a part of the reorganization effort, the Red Cross released updated versions of five of the original patterns in 1918, including a completely revised sleeveless sweater pattern. This updated sweater had a more flexible collar. 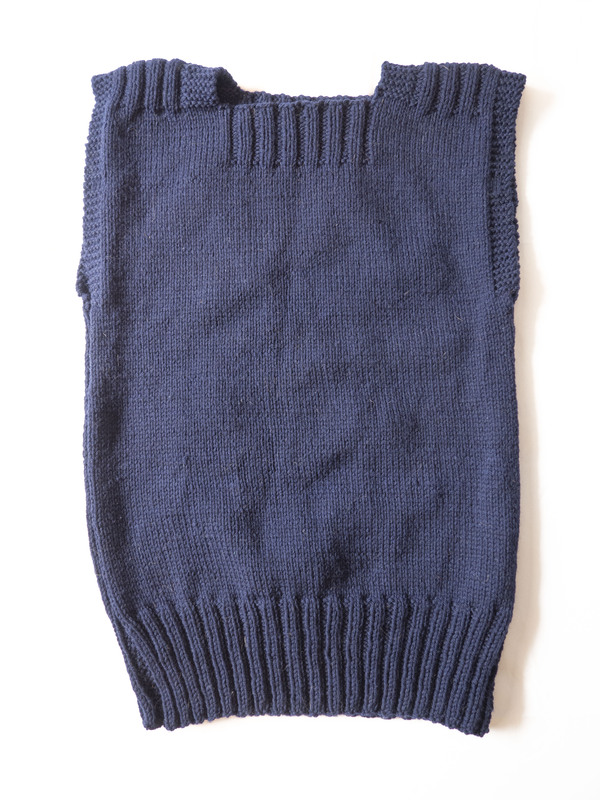 The original sweater featured a ribbed hem, but the rest of the garment was constructed entirely in garter stitch with rectangular opening for the wearer’s head. The finished garment was uncomfortable and constricting, and knitters were warned that “the necks of sweaters should be made sufficiently large to go over the heads of men, as otherwise the men cut the necks and the sweaters were ruined.” The new sleeveless sweater pattern, ARC 400B, was a substantial rewrite and included a ribbed hem and a wider ribbed collar, making it easier for a serviceman to pull over his head. The “heavy-weight” version (meant to be knit in the equivalent of worsted weight yarn today) also included as stockinette body. When the pattern was updated again in the late 1930s, the Red Cross adopted the heavy-weight version for wider use, and their only revision was to add more collar ribbing, and to add a v-neck collar for sweaters distributed to the Army. Additional sizes were added in the 1940s, but otherwise, the sweater itself was remarkably unchanged. After the First World War ended in November 1918, the Red Cross scaled back their large national program for servicemen and focused their production efforts on providing aid for refugees in Europe and support for the Influenza epidemic. In 1919, they disbanded several departments at the national level that had been created for the wartime emergency, including the Department of Development, and in 1920, the knitting and sewing program was reorganized under a new volunteer branch called Volunteer Services that brought all of the Red Cross’s volunteer programs under one roof. Now called the Production Corps, the knitting and sewing program continued making knit and sewn clothing for military and veterans hospitals, although their emphasis shifted from providing knit clothing for the military to providing clothing for children and adults in the United States. Periodically, large nationwide campaigns were arranged to fill a specific need for clothing, as in 1925 when the Production program organized a sweater drive for veterans. 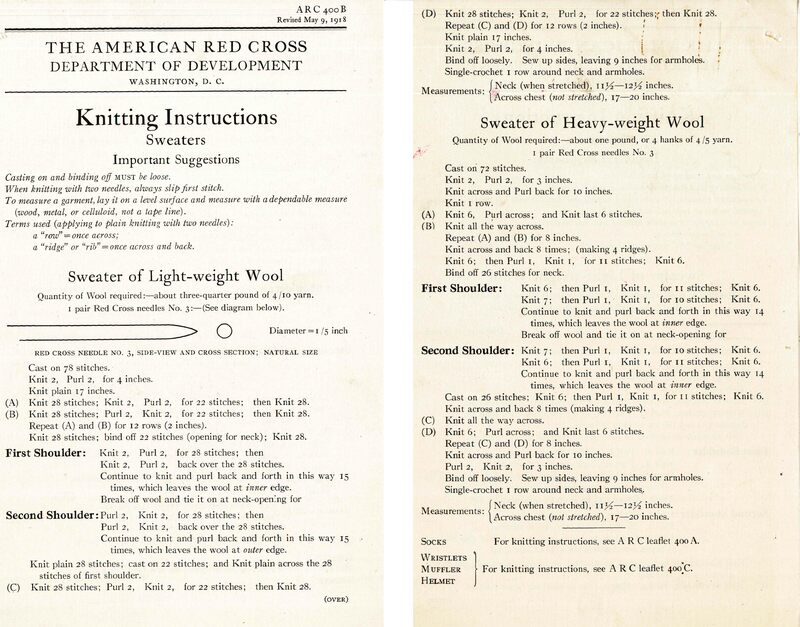 Throughout the 1920s and 1930s, the Red Cross released updated knitting and sewing guidelines for volunteers, slowly shifting from providing complete knitting and sewing patterns to recommending specific commercially available sewing patterns for volunteers and printing their own knitting patterns. The Red Cross continued to update their knitting and sewing patterns over the twenty years between the First and Second World War. When Hitler invaded Poland in September 1939, the Red Cross’s clothing production program moved into action quickly, and released an updated and abridged version of their guidelines garments for refugees guidelines, which included knitting patterns for civilian men, women, and children. Volunteers enrolled in the “Production Corps,” the Red Cross’s volunteer branch in charge of making clothing and surgical dressings, doubled between 1939 and 1941. Between September 1939 to September 1941, nearly all of the production efforts were focused toward civilian foreign war relief and items for hospitals like surgical dressings and comfort bags. However, so many volunteers remembered knitting for the First World War that they began writing to their individual chapters to ask whether there would be a national knitting program to provide sweaters and other comforts to the servicemen in military training camps. At the end of September 1941, the Chairman of the Red Cross, Norman Davis, finally announced a knitting program that would supply active servicemen with sweaters and other comforts. The priority would go to hospitalized men, and those stationed “in remote outposts like Iceland or the Philippines,” and finally to those men stationed at home in the United states. In letters sent to the Secretary of the Navy and the Secretary of War, Davis gave two major reasons for the program. First, Red Cross officials felt strongly that knitting was one of the “traditional” duties of their organization, and wanted to maintain their position as the main line of relief for the military. Second, there was some concern that the enthusiasm of Red Cross volunteers needed to be contained. When Davis announced the program to the Secretaries of War and the Navy, he wrote that women had been writing their chapters to ask whether the Red Cross would organize another knitting program and were threatening to start one themselves if they couldn’t knit for the Red Cross. When the program started in 1941, the Red Cross announced that two different types of sleeveless sweater would be available, one with a round neck and one with a “v” neck. The round neck sweater was available in navy blue for Navy use and maroon for hospital use. 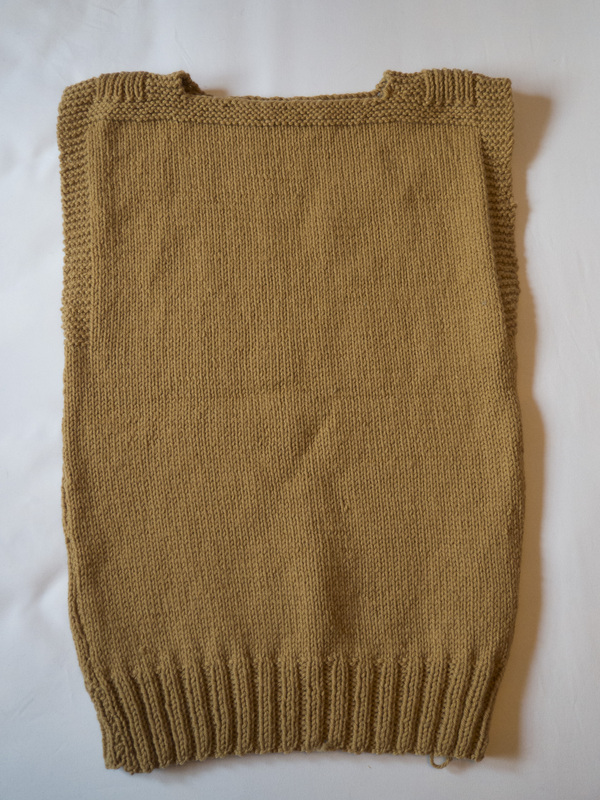 An olive drab sleeveless sweater with a “v” Neck was available for the Army, Air Force, and Marines. The “round necked” sweater was a familiar garment. Although it was labeled ARC 400-3, the pattern itself was a slightly revised version of the heavy-weight sweater included first introduced in May 1918. By October 1941, the Navy had requested that Red Cross volunteers knit sweaters according to their own patterns and not those issued by the Red Cross. Accordingly, the Red Cross had their volunteers knit turtleneck sweaters and other garments based on Navy issued knitting patterns. By 1944, when women members of the WACs (Women’s Army Corps) were serving abroad, the Red Cross expanded their pattern stable to include a women’s sleeveless sweater. This pattern was based on the “v” neck sweater issued to men, with a shorter waist and expanded bust. By the end of the First World War, Red Cross volunteers had knit over twenty-three million garments for the military. By the end of the Second World War, Red Cross volunteers had knit almost ten million garments for able-bodied servicemen, and an additional nine million for men in hospitals. The time and physical labor invested in each of these garments was significant, and the Second World War effort would mark the last time the Red Cross organized a large scale knitting effort for the military. Afterward, The Production Corps continued producing knit and sewn clothing, but volunteers primarily worked to make clothing for civilian relief, war brides, and hospitalized servicemen and veterans until 1965, when the Red Cross combined all their volunteers into one unified branch. During the first half of the twentieth century, the American Red Cross was an important force in providing relief to active soldiers, but they did it with the help of millions of American knitters and carefully designed, easy to knit patterns. CKC board member and knitting historian Rebecca Keyel’s doctoral dissertation, “Defense Knitting: Women’s Volunteerism During the First and Second World Wars,” examined American women’s knitting for servicemen during the First and Second World Wars and its relationship with labor, patriotism, and the cultural moment of the home front. Much of this research is drawn from the American National Red Cross Central Decimal Files, Record Group 200, at the National Archives at College Park, Maryland. Some of these files have been digitized and are available online, but most are not. The Pittsburgh Chapter of the American Red Cross, Pittsburgh: Pittsburgh Printing Company,1922. Joy Homer, “Present Arms,” The Red Cross Courier, November 1941. The Work of the American Red Cross in the World War: A Statement of the Finances and Accomplishments For the Period July 1 1917-February 28, 1919, Washington, D.C: American Red Cross, 1919. Minutes of the Woman’s Advisory Committee, June 13, 1917, 1. Folder 118.922. Box 112, Series 1917-1934, Record Group 200, American National Red Cross Central Decimal Files, 1917-1934, NACP. In contemporary terms, this equals about a DK or light worsted, or 11 wraps-per-inch. The Work of the American Red Cross in the World War: A Statement of the Finances and Accomplishments For the Period July 1 1917-February 28, 1919, (Washington, D.C: American Red Cross, 1919), 23. American Red Cross Annual Report (1945), 97.